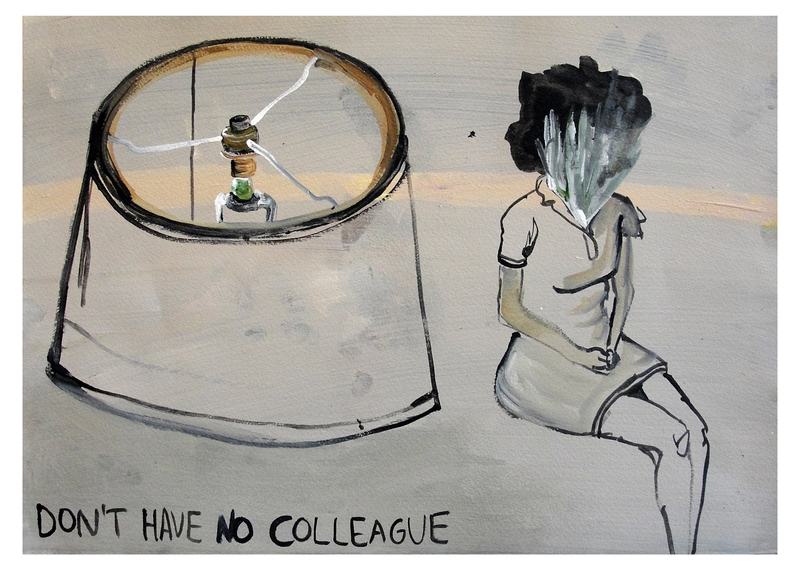 On May 5th, Featured Artist Gabriela Vainsencher presents Don’t Have No Colleague, a solo exhibition at RAC. Don’t Have No Colleague features work from Vainsencher’s four-year-old Morning Drawing project. Since January 22, 2008 Vainsencher has made a drawing and posted its image on her website (gabrielavainsencher.com) every morning, totaling over 1,200 works. As a trilingual foreigner working in her third language, modes of communication and the mechanics of narrative devices are especially significant to Vainsencher. Her obsession with the meaning(s) of words has evolved into a preoccupation with the relationship between the painted object and the narrative she creates for it. Using subtle distortions of objects, animals, and people, combined with darkly humorous, morose or even morbid text, Vainsencher creates intriguing and discomforting juxtapositions in her drawings. Her works remind the viewer of a person saying something so strangely funny or sad that one is forced to laugh uncomfortably and try to look away. The viewer may fix their eyes on a light or a chair to avoid the discomfort. But in Vainsencher’s single-frame narratives, even those inanimate domestic objects offer judgments, platitudes, and lamentations. There is nowhere to hide, leaving the viewer at once alone with their own thoughts and yet surrounded. Gabriela Vainsencher was born in Buenos Aires, Argentina, and raised in Israel. In 2005, she earned a Bachelor of Education and Fine Arts from the School of Art at Beit Berl College in Israel and soon moved to New York to pursue her career as an artist. In May 2011, she participated in Recession Art’s Irrational Exuberance group show at the Invisible Dog Art Center in Brooklyn. Her drawings, videos, and installations have been shown widely in solo and group shows in the United States and abroad, including Mass MoCA in North Adams, Massachusetts, La Chambre Blanche in Quebec City, the Freies Museum in Berlin, and Pierogi Gallery and Parker’s Box in Brooklyn. She has participated in several artist residencies, including Yaddo in 2008, La Chambre Blanche in 2009, Triangle Arts Association in 2010, and the Atlantic Center for the Arts in 2011. She lives and works in New York and Philadelphia and occasionally teaches art at Williams College in Williamstown, Massachusetts.